Discussion in 'Lenovo (IBM)' started by ibmthink, Feb 11, 2017.
sonichedgehog360, kneehowguys, fb1996 and 4 others like this. While I love that there are more 15" active digitizer becoming available, I wonder will they ever move away from the 16:9 aspect ratio? I'm delighted they have an ad showing portrait mode for art use (which is so often neglected), but even the ad designer must have thought that looked cramped to work on. wataru, thundercracker, kinonotabi and 2 others like this. The issue is that 16:9 is still the standard, so unless the whole industry switches, I don´t see a single manufacturer making the jump - because non-standard screens are more expensive, so switching gives you a competitive disadvantage from the cost-perspective. I do think its becoming more obvious that its the next necessary step. Look at the big bottom bezel on these (the chin). Just the same as the Yoga 910. That bezel also needs to go. sonichedgehog360 and fb1996 like this. So in other words, Microsoft will have to, again, create a completely custom 3:2 screen in order to show the world the obvious workspace benefits. And they'll have repeat for every screen size before the other OEMs will follow: 12.3", 10.8", 13.5", 28", and now hopefully, 15.6". Lol, this a joke. Seriously MS isn't selling nearly the volume of other OEMs, yet if they can turn a profit, so can they. wataru and thatcomicsguy like this. Pretty much. This was the reason why the released the Surface brand originally. Because the PC manufacturers are all acting very risk-averse and put out very stale, underwhelming products for the most part. I do hope the 2nd Gen of the Surface Book is a bigger success, to show that people do value 3:2 on bigger screens as well, not only on smaller 12" Tablets. fb1996 and thatcomicsguy like this. This is such a nice-looking 2-in-1! The Dell 7568 felt a lot like a beta test; it didn't even officially exist as a pen tablet. -It'll be great to see an actual 15.6" pen supporting Yoga at long last! The 14" Yoga got such great hardware props; if this 15.6" build hits those same high notes.., well then..! I wonder if the stylus will work on the UHD version of the 15.6"? That would be a first for AES. The Spanish tech show where this will debut is happening in just a couple of weeks. (With rumors, also of a Surface 5 reveal.., but we'll see about that!). Seems like 2017 might be the year we've been waiting for. 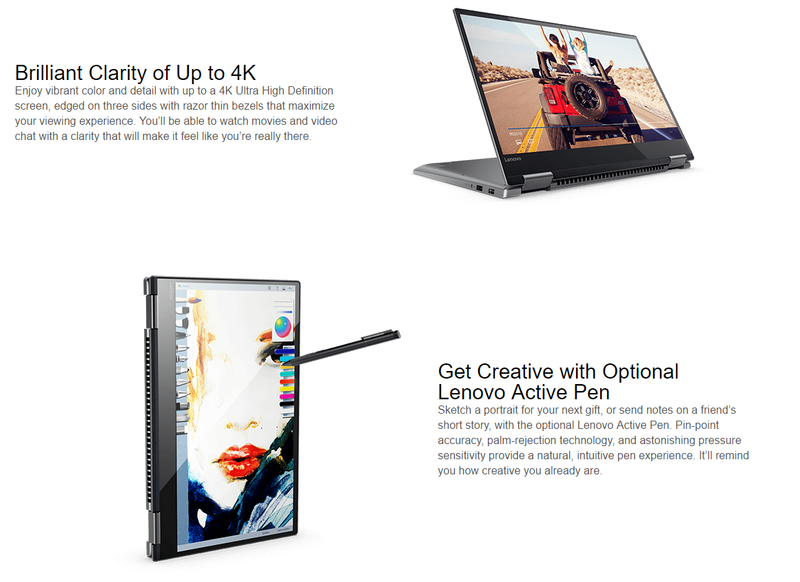 I would have been even more interesting if the Lenovo Active Pen 2 would have been mentioned. I wonder what the compatiblity of that might be. The digitizer of the Miix 720 is compatible with both Active Pen and Active Pen 2, but I wonder what Wacom AES-enabled panels that will work with fully. I hope this one have full x4 TB not the gimped one as it lacks many ports already like LAN, SD card, display out. That's like waiting for hell to freeze over.